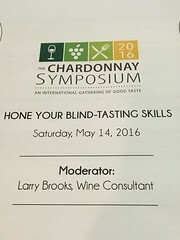 The Chardonnay Symposium is the sister event to the Cabs of Distinction, and is equally awesome. The 2016 event yet again did not disappoint. We were able to pick from a list of several different great seminars, thankfully some were similar to those I went to last year, so I was able to attend other ones that also interested me. 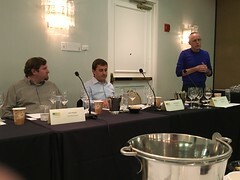 The 2 seminars I chose were the Wente Clone Comparative Tasting, and the Hone Your Chardonnay Blind-Tasting Skills but I also got to attend the Pét-Nat Sparkling Wine & Oysters Gala, La Paulée Dinner and Vintners Awards Ceremony (thanks to my date Glenn from Adelaida), and of course the Saturday Grand Tasting. The Wente Clone tasting was held in Avila Beach at the Avila Lighthouse the moderator was Randy Caparoso of Somm Journal and Tasting Panel Magazine, and the panel included: Mike Hendry, Hendry Ranch Wines, Larry Hyde, Hyde de Villaine, Karl Wente, Wente Vineyards, Jonathan Nagy, Nielson Wines, Greg La Follette, La Follette Wines, Cameron Frey, Ramey Wine Cellars. During a 30-40 year year period, Ernest Wente selected Chardonnay vines with favorable traits, and re-planted them to create the Wente Clone of Chardonnay. As a result Wente Vineyards was really the first winery to develop the Chardonnay clones that are so popular today, about 100 years ago. A ‘”clone” refers to vines descended from a single plant by taking a cutting or bud; in theory, each vine grown on a clone is genetically identical to the original vine…Herman and his son Ernest Wente released the nation’s first varietally labeled Chardonnay in a 1936 vintage” and achieved international acclaim on the 1959 vintage. As a result, the Wente clone is now the most widely used, and Chardonnay is the #1 selling varietal (particularly among women) with almost 100,000 acres planted in California alone. We tasted approximately 11 different Wente clone Chards from the various wineries represented and had a fascinating compare and contrast discussion. Then it was off to the Pét-Nat, Sparkling Wine & Oysters Gala held at the Avila Beach Golf Resort. 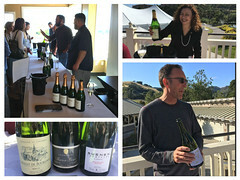 Twenty different producers showed up with their different bubblies. Pét-Nat which is short for pétillant naturel (a.k.a. méthode ancestrale) has a low alcohol content, is lightly effervescent, and ranges from being dry to slightly sweet and is often topped with a crown cap versus a cork. Unlike Champagne, Pét-Nat can be made from any grape varietal; uses naturally occurring yeast while fermenting in the bottle and has way fewer laws surrounding it’s production. The pairings with oysters from the Morro Bay Oyster Company were just delightful, and delish, as the flavors of each brought out the best in the other. 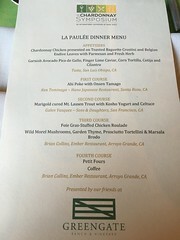 Then it was off to Greengate Ranch and Vineyard for the La Paulée Dinner and Vintners Awards Ceremony. My wonderful “date” for the evening was a very dashing Glenn Mitton, the wine librarian at Adelaida Winery. What a blast! We started outside the elegantly decorated barn milling around with glasses of bubbly and then made out way in to our tables. The dinner was a multi-course meal prepared by Chef Brian Collins of Ember Wood Fire Restaurant and if you follow us on Instagram or Twitter (if you don’t we welcome you to start), you know how much we love him, his cooking and his restaurant; Taste, San Luis Obispo, CA, Chef Ken Tominaga of Hana Japanese Restaurant, Santa Rosa, CA. ; and Chef Galen Vasquez of Sons & Daughters, San Francisco, CA. Several fantastic winemakers/owners/representatives including Glenn brought some special library wines to share with the their tables and others. It was a smashing evening with great food, fantastic wine, wonderful people and awards galore! 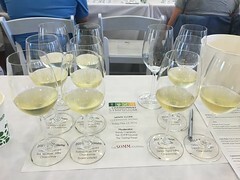 The following day was one of my favorite events thus far….the Hone Your Chardonnay Blind-Tasting Skills seminar. Alexandre Schmitt was a perfumer who became disillusioned with perfuming and began systematizing the aromas in wine. Perfume ingredients are very similar to the aromas in wine so it was a natural transition. When practicing with scents he said, you want a scent that is very really light so usually diluted essential oils are the best way to go. When honing scent skills it’s best to look for the 6 aspects that make up the aroma descriptors: citrus, floral, resinous, balsamic, woodsy, and animalic. Something like a lemon is actually about a 1/2 dozen different aspects making up it’s essence. Also be cautious when you describe a scent, for example by saying “violets smell like Grandma,” no one but you and your family knows how grandma smells. Saying the floral aspects of Chardonnay is typically white flowers such as gardenias and jasmine, and lemon is a predominant note; is preferred. To further qualify the descriptors of lemon one asks “what kind of lemon?”. Is it: strong, lemon zest, bright, fresh, ripe sweetness- as in fruity (sweet in dry wine is not sugar). Is there a green aspect- leafy, or limoncello? Italy is known to produce the best lemon and orange scents. Other examples of descriptors include Pear which is found in the esters of some of the best Chards, and has a multitude of different notes that make up the whole scent including: floral, marzipan, pomme, bitterness, gritty, pear skin. You can tell when wild yeast is used in a chardonnay because it is what brings out the pear note. It comes in at a “higher tone” that you can discern by anything that burns your nose; and the scent comes to you, not you having to go to it and has a lifting aroma. An indication of botrytis is an Apricot note offering tropical and passion fruit flavors, more of a cooked and jammy aspect not fresh off the tree, producing almost an over ripeness to it. Something like Fennel seed is more pungent and you get confectionery licorice and anise, it’s more resinous and has a note that is even reminiscent of NyQuil. Hay Absolute shows hints of honey, sweet, earth and mezcal, with toffee and balsamic aspects, hints of wax and rubber. It’s quite pleasant, with dry hay, greenness, raiseny and bretty ( brettanomyces) notes. After the Seminar it was off to the Grand Tasting back at Green Gate Ranch and Vineyards. We arrived, picked up our glasses and went off to taste. The tastings were set up under 3 tents, 2 had the wines and one had the Silent Auction table. There were multiple wineries from around the world and many of our favorite local winemakers and wineries were there. It was great to see them all. We were able to catch up with Daniel Daou, Ryan Devolet, Eric Johnson of Talley, saw Glenn from Adelaida again and even made some new friends like Testarossa. Sophie and Paul were there from Fromagerie Sophie giving out yummy samples of cheese and pâtés. The day and the entire event was a rousing success. Now with the 2017 event coming up the excitement is back to building, so make sure you get your tickets and buckle up for the next one. They are never a disappointment and always a phenominal learning experience.